These two graphs show the same thing: changes in temperature over time. The top graph shows a series of different measurements confirming the same trend while the bottom graph has consolidated the data into one average line which is likely easier to understand line (the shaded grey area represents the variation around the average). The top graph is from Kaufman et al. (2009) in the journal Science and the bottom graph is from the Arctic Research Consortium of the U.S (www.arcus.org/synthesis2k/synthesis/index.php). 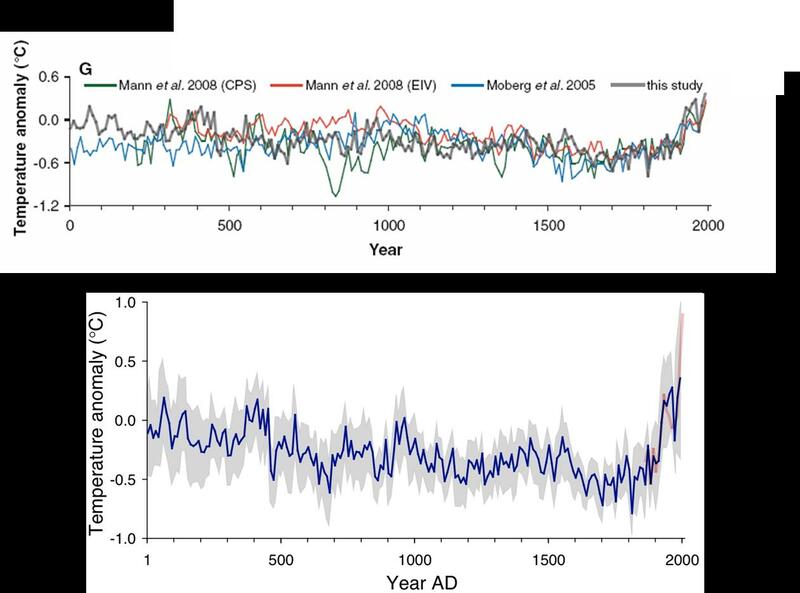 The researchers were asking the question, how does current change in climate compare to historic (i.e. paleo) changes in temperature and are contemporary change in temperature significantly different than in the past. In this study the scientists used previously published “proxy” measurements of temperature history in the Arctic using lake sediment cores, glacial ice cores and tree ring data. The use of proxy measurements are common when assessing paleoclimates as they are science’s way of obtaining data from past environments. The y-axis shows temperature anomaly in degrees Celsius. Temperature anomaly measures deviations from an average. Therefore in these graph 0.0, on the y-axis, represents the long-term temperature average and points above and below 0.0 represent changes in temperature with respect to that average. For example, the average temperature at year 500 AD was below the long-term average of temperature over the time-period of Year 0 to Year 2000 A.D. What the take-home message is from this graph is that since Year 0 the Arctic has actually been experiencing a long-term cooling trend; that is, until recently. Starting at approximately 1900 there is a steep increase in temperature anomaly. The top graph demonstrates this temperature change using four different measurements (as noted by the multiple citations at the top of the graph). Notice too that on the bottom graph is the addition of a red line. This red line is temperature measurements using actual temperature records made with modern instruments. In the original Science article the authors also point out the five warmest decades over this 2000 year period have occurred between 1950 and 2000. 1.These graphs provide the opportunity for the teacher/instructor to reinforce certain aspects of the scientific method: multiple studies, trials/replication, repeating experiments, peer review, etc. http://cpcc.bscs.org/index.html — click the “lesson” tab and then lesson 3. Scroll down and watch video about how scientists actually do research in these extreme envrionments (e.g. Antarctica and the Arctic) and how these perform the analyses.